IRCN is organized into Four Complementary Research Units with a goal to collaborate on the development of the new field of Neurointelligence. The mission of each individual unit is to collaborate with the other units, and IRCN management will facilitate synergy via research policies, facilities, and programs. The units and connections are illustrated. The Development Unit pursues the principles of brain development, particularly of neural circuits and their anatomy, physiology and connectivity, and their links to behavior. These principles will be used to inspire better computational models of neural networks and AI, and also to drive new clinical research and bedside applications. 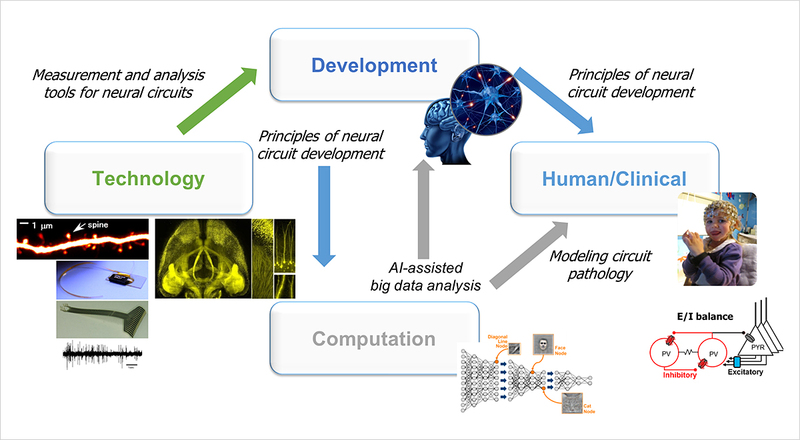 The Technology Unit develops state-of-the-art advanced techniques of neural circuit analysis and measurement, including novel imaging tools, methods and microscopy, mouse transgeneic and knockout technologies, fluorescent and bioluminescent probes, and measurement of activity from neuron to brain scale supporting the other Units. The Computation Unit creates computational models and neuro-inspired AI based on the principles of neural circuit development in cooperation with the Development Unit, and systematically analyzes big data utilizing methods based on mathematical science and AI. The Unit will also work with the Clinical Unit to allow model to bedside approaches. The Human/Clinical Unit works with the Computation Unit to develop frameworks for computational psychiatry based on cohorts with brain disorders. Studies will also be conducted on normal human development and cognition such as language involving imaging and physiological data from subjects for understanding human intelligence. Collaboration with the social sciences and humanities and neuro-inspired engineering including robotics applications are also strategic priorities for IRCN to connect to society.